Part II of my extended meditation on The Meek Shall Inherit the Earth. Here’s Part I. 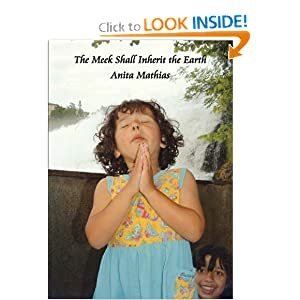 Do the meek really inherit the earth? “The earth,” or την γην, ten gen, to the Jewish mind signified the beloved land, Eretz Israel, the promised, longed-for land of Canaan. It was used “as a proverbial expression to denote any great blessing, perhaps as the sum of all blessings,” (Barnes’ Notes on the Bible). So the meek inherit it all, the whole enchilada. Indeed, some Bible commentaries suggest that meekness contributes to success, even economic success. And I believe this paradox is true! The value of meekness, even in regard to worldly property and success in life, is often exhibited in the Scriptures. It is also seen in common life that a meek, patient, mild man is the most prospered. An impatient and quarrelsome man raises up enemies; often loses property in lawsuits; spends his time in disputes and broils rather than in sober, honest industry; and is harassed, vexed, and unsuccessful in all that he does. Barnes’ Notes on the Bible. “These meek ones are happy, even in this world. Meekness promotes wealth, comfort, and safety, even in this world.” Matthew Henry’s Commentary. Hmm… Are there other benefits of meekness? Meekness is essential for marital harmony and long continued friendships. A gentle answer turns away wrath, but a harsh word stirs up anger, Prov. 15:1. I look back and wonder how many of our marital quarrels could have been averted by a mild answer? How many friendships would I have saved? The deep wish, or the deep truth, that the meek inherit the earth is embedded in myth and fairy tale: think of Beauty, Cinderella, Snow White or Psyche. In Scripture, in fairy tales and in real life, there is a special favour and protection extended to the youngest, who is generally the meekest, the gentlest, the least powerful, the most innocent, and the most in need of protection. Kindness to the meek comes instinctively to most human beings and is encoded in our natures (though not in everyone’s: there are bullies, among Christians as well as non-Christians). It throbs with it. It sings with it. And to whom does this glorious earth belong? Not to those who own hundreds of its acres but lack the time to step out in them. Not to those who are so preoccupied with acquiring or maintaining their possessions that they have no time to enjoy in the great simple gifts given unasked: sunrise and sunset, maples blazing in autumn, the moon sailing through winter skies, daffodils and bluebells in spring, and late summer evenings, when the world is golden. The earth belongs to those who have the time to enjoy it. It’s not necessary to own land to enjoy it; you just need to be out in it, with a quiet heart, not one anxious or distracted. The earth belongs to those who have time for it: to observe it, admire it, love it, and walk out on it. The earth belongs to those whose heart is calm and stilled so they are able to slow down and appreciate the beauty of the earth, the ever-changing canvas of the skies, which, day by day, hour by hour, silently proclaims the glory of God. And, mysteriously, Scripture tells us that the meek will inherit this earth. In a way we do not understand, it will be given to them. What kind of math is this? Addition by subtraction, gaining by losing, cracking yourself open like a grain of wheat to gain a mighty harvest. It is the mysterious mathematics of the Kingdom of God, in which everything happens because of the X Factor, the secret power of God. Religious people are sometimes accused of checking their brains by the front door. In this case, yes, I guess I am doing it. I am taking it on faith that the meek inherit the earth because Jesus says they do, and whenever I have experimented with his words I have discovered that he is, indeed, absolutely right.